For the humbucker bridge in this set, Dragonfire Neo Hex Rails are designed to deliver in high-output, high-demand styles with rail styling along with hex-screw adjustable polepieces. 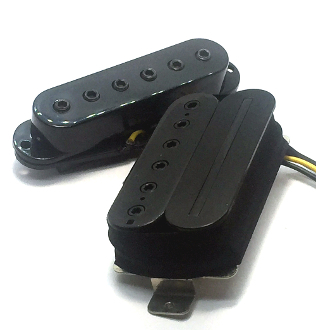 The neodymium magnets offered in these pickups provide hotter response and a cooler tone than standard ceramics without going too blue like an alnico. These are a more sensitive and expressive magnet style to give you a high fidelity hot response for a more nuanced performance. Pairing nicely with the Neo Hex Rail, the Dragonfire Hex Single features adjustable Hex Screw style poles and uses dual ceramic bars for more complete coverage. This magnet style gives crisp tone and clean edge performance. Matching the Neo and Ceramic magnet styles provides versatility and unique sound.